Restriping Your Parking Lot – Plan Now! If the lines on your lot are starting to fade, you should think about restriping it. Are your parking lot lines starting to fade? Having clear lines is essential to having an organized parking lot. They fade over time due to the amount of traffic your lot receives as well as exposure to the sun and weather conditions. It’s important to have parking lot lines restriped every 18-24 months or so for safety as well as aesthetic reasons. Could your parking lot use restriping? Here are some benefits that might convince you to start planning for a restriping project now. The first reason you should restripe your parking lot is simply because it looks good. While that may not sound like a great reason at first glance, consider the perception of your business’ customers. Appearances are everything for a business looking to attract customers, and while other services such as landscaping get a ton of credit in this regard, don’t overlook the impact of a bright, freshly restriped parking lot! In addition, your parking lot is one of the amenities your business provides to customers. Restriping your lot implicitly tells them that their experience at your establishment matters to you. It’s all part of a complete approach to providing the best service to your guests. The Americans with Disabilities Act provides requirements for parking lot stripes and spaces. Your lot will need to have a certain number of handicap accessible spots depending on the number of total spaces in it. Restriping makes these spaces crystal clear and gives your disabled guests the proper accommodations. Fire codes also designate requirements for parking lots – a fire lane needs to be designated, complete with all markings and signs on curbs and pavement, for use in an emergency situation. Your restriping project can, therefore, help you stay in compliance with your local fire codes. A parking lot with faded lines could result in accidents on your property. If your customers could not see the lines on your lot, your business could be found at fault in the event of an accident. Faded lines are confusing, but clear lines are authoritative. 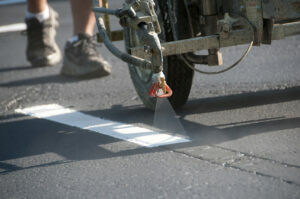 Therefore, restriping your lot can lower your risk of liability in the event of an accident. This entry was posted on Thursday, January 26th, 2017	at 9:22 pm	and is filed under Asphalt	. You can follow any responses to this entry through the RSS 2.0	feed. Both comments and pings are currently closed.